Save the date! – The next EpiCSA/RNA special interest seminar series is just around the corner. Please note slight change of venue, still at AHMS but, moved to Level 6 seminar room on this occasion (not Level 3 as per usual). Hope to see as many of your as possible, all colleagues welcome! Don’t miss out on EpiCSA first student event of 2018! The last date to register for this event is fast approaching. Please RSVP here by Monday (9th July) for catering purposes. See below flyer for details of the event. Come along to the latest edition of the EpiCSA/RNA special interest seminar series showcasing exciting research in field of Epigenetics and RNA biology. Looking forward to seeing you all there! Come join us at The Elephant British Pub for drinks and food at our student-only Happy Hour event on July 19th. This is a great opportunity to get to know other students in your field and share your research experiences. Your ticket will provide you with a free beer or cider on us! Free food will be available and drinks will be subsidised until the tab runs out! The EpiCSA student representatives Ayla Orang and Saira Ali will be there to welcome you. Make sure you remember to RSVP for the event here! We are kicking of our seminar series for the EpicSA/Adelaide RNA Special Interest Group on Thursday 31st May! New Venue for 2018: New Adelaide Heath and Medical School (AHMS) Building in the west-end biomedical precinct (Level 3, seminar room 3066). Drinks and nibbles provided. See below flyer for details. Please display in your local area and encourage all of your colleagues to come along – all welcome! Come see this months amazing speakers! September 29th 4pm at the University of Adelaide Health and Medical Science (AHMS) building on North Terrace (City West precinct). Keep warm with this months hot seminar! See you all there on Friday August 25th! After last month’s Epigenetics event, we’re going completely RNA for the month. Looking forward to seeing you all there! This week we have a special guest! Make sure you don’t miss out on Maurizio’s talk! Introducing the new seminar series, jointly presented by EpiCSA & the Adelaide RNA Special Interest Group! Our seminars will be held on the last Friday on each month, and will have one Epigenetics and one RNA biology talk. Happy new year to all of our EpiCSA members! While most of you are bunkering down and writing research grants, we have been hard at work organising some new events and workshops for 2017. To kick off a brand new year for EpiCSA, we are starting a regular seminar series with the Adelaide RNA Interest Group! While details are yet to be finalised, we can tell you that they will be on the last Friday of each month starting in March, and will feature two speakers from both subject areas (epigenetics and RNA biology). Some drinks and food will be provided at each seminar with the help of our wonderful sponsors. Additionally, we have set the date for our 2nd annual research meeting, which will be an all-day event held on Friday October 6th. 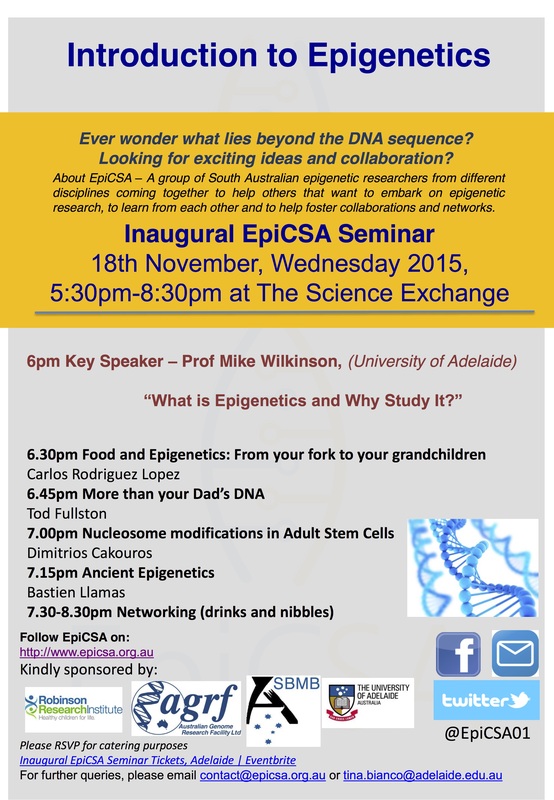 Come down to celebrate a great year of Epigenetics in SA! Thanks to everyone for making our annual research meeting a massive success! Abstract Submission extended to September 16th, 2016. Submit and/or register now! We are pleased to announce the date and preliminary details for the Epigenetics Consortium of South Australia’s first annual research meeting! Our guest plenary speaker for the event will be ARC Future Fellow & University of Western Australia Professor Ryan Lister. Ryan is a research leader at the ARC CoE Plant Energy Biology & Laboratory Head of Epigenetics and Genomics at the Harry Perkins Institute of Medical Research, and is a world-leader in the study of Epigenetic dynamics during cellular reprogramming, differentiation, and development, as well as the study of Epigenetic reprogramming. We will send out a call for abstract submission in the next week. Stay tuned to epicsa.org.au for additional details. Registrations are now open for EpiCSA’s 2nd workshop of 2016: Bioinformatics & DNA Methylation Analysis. This event is generously sponsored by the University of Adelaide’s Bioinformatics Hub. Looking forward to seeing all our members on June 22nd! Thanks to everyone for coming to our last workshop! In the meantime, we’re pleased to announce another workshop, which will be held at the University of Adelaide on Wednesday June 22nd. We will be talking about DNA methylation analysis using Bioinformatics, and will include some computational training exercises. Details, including a registration link, to come in the coming weeks! We’re pleased to announce our first EpiCSA workshop of the year “Introduction to Epigenetics” which will be held at SAHMRI on Wednesday 30th March. Registration is free, and can be done through Eventbrite (https://www.eventbrite.com/e/epicsa-workshop-introduction-to-epigenetics-tickets-21897528096). Looking forward to seeing you all for the first of many workshops and events throughout 2016! To wind down our first year as the Epigenetics Consortium of South Australia, we will be having informal Christmas drinks this Wednesday evening (December 16th) at the Wheatshef Hotel, George Street, Thebarton (http://wheatsheafhotel.com.au/). Please come and join us to celebrate the holidays and another exciting year of Epigenetics research in South Australia.